If you need any proof that players who score a lot of points find a way onto an NBA All-Star Game roster, consider this: Of the 31 players who are currently (through games of February 8) averaging 20 or more points per game this season, 20 of them are on one of the two NBA All-Star Game rosters. Of the 11 players who are averaging 20+ points per game that did not make the All-Star Game rosters this season, Devin Booker leads the way with a 24.9 points per game average this season. He is tied for 12th in the league’s scoring race. There are six players who made this year’s All-Star Game who have a scoring average less than 20 points per game: Dwyane Wade (14.0) and Ben Simmons (17.0) from Team LeBron; and Kyle Lowry (14.2), Khris Middleton (17.3), Dirk Nowitzki (4.4) and D’Angelo Russell (19.8) from Team Giannis. For the record, Wade and Nowitzki were added to this year’s roster by Commissioner Adam Silver as special roster additions. Here are the players who made an All-Star Game roster in a season when their season-ending scoring average was 10 points or less that year. 1 season: Don Buse, James Donaldson, Mark Eaton, Bill Gabor, Tom Gola, Bob Harrison, Dikembe Mutumbo, Andy Phillip, Richie Regan, Bill Russell, Wes Unseld. There have also been 25 players who averaged 25 or more points per game in a season that did not make an NBA All-Star Game roster that season. Three players, Damian Lillard, Michael Redd and Purvis Short have had it happen to them twice in their careers. Here’s one more stat: Noted above is that 20 of the 31 players averaging 20 or more points per game this season made an All-Star Game squad (64.5%). Of the 17 players averaging 10 or more rebounds per game this season, seven (41%) made the All-Star game; of the 14 players averaging seven or more assists per game, seven (50%) made the All-Star Game; of the 15 players averaging 1.6 or more steals per game, six (40%) made the All-Star Game; and, of the 14 players who are averaging 1.5 or more blocks per game, only three (21%) made an All-Star game roster. Yes, the numbers show us… putting the ball in the basket is the key for finding a way onto an NBA All-Star Game roster. Milwaukee Bucks fans will see something they haven’t seen in more than a decade on February 19: They will see a player from their team playing in the NBA All-Star Game. 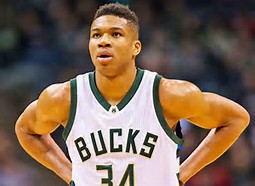 Giannis Antetokounmpo will be a starter for the East squad in the game, making him the first Bucks player to play in the NBA All-Star Game since Michael Redd in 2004. In that 2004 game, Redd tallied 13 points. Since that game in ’04, Bucks players have not scored a point in the All-Star Game. During that same timeframe, two teams, Miami and Oklahoma City, had players who scored over 300 points in the game. The Heat led the way with 368 points, while OKC/Seattle franchise players during that time had 337 points. Following are the number of points scored by players from each NBA franchise in the NBA All-Star Game from 2005 to 2016 (current franchise city is listed). 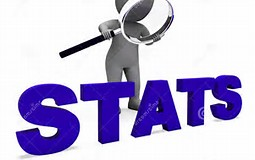 “SIX STATS…” is a bonus feature of Sports Stats ‘on Tapp’ and is published every Friday. The 61st version of the NBA All-Star Game will be held this Sunday in Orlando. Here are a few interesting stats about the history of this game. 1. The team that has the lead at halftime has won 46 and lost only 12 (the game was tied at halftime in two contests). The East has a 26-3 record when leading at halftime. 2. Seven players have scored 20 or more points in the game and had zero assists in the game. Bob Pettit and Dominique Wilkins lead this contingent. Pettit had 29 points and no assists in the 1961 game; Wilkins had 29 points and no assists in the 1988 contest. Others: Paul Arizin (26 points/0 assists in 1952), Pettit (25 points/0 assists in 1963), Dave DeBusschere (22 points/0 assists in 1967), Willis Reed (20 points/0 assists in 1970), Karl Malone (28 points/no assists in 1993). Malone is the last player to “accomplish” this feat. 3. Of the previous 60 games, only 19 were decided by five points or less. However, five of the last 11 games have been decided by five points or less, including the last two. Ten of the 60 games have been decided by 20 points or more. 4. Based on a minimum of ten shots taken, eight players had a shooting percentage of .800 or above in an NBA All-Star Game. The eight: Oscar Robertson (1970, 9 of 11, .818), George Gervin (1985, 10 of 12, .833), Patrick Ewing (1990, 8 of 10, .800), Mark Price (1994, 8 of 10, .800), Tim Duncan (2000, 12 of 14, .857), Kenyon Martin (2004, 8 of 10, .800), Dwyane Wade (2006, 9 of 11, .818), Brandon Roy (2008, 8 of 10, .800). 5. The team that gathers more rebounds in the game has a slight 31-29 edge. The West has won the rebound battle in 35 of the 60 games. Remarkably, they have outrebounded the East in the last 13 games. The team that has a higher shooting percentage for the game has won 44 of the 60 games. Each team has had the better field goal percentage in 30 games. In eight of the last nine games, the team that has a higher field goal prcentage for the game has won. 6. Last season Lakers teammates Kobe Bryant and Pau Gasol combined for 54 points in the 2011 NBA All-Star Game. They became only the fifth pair of teammates to combine for 50 or more points in the all-star game. The others: 1961-Hawks teammates Bob Pettit and Clyde Lovellette, 50 points; 1962-Lakers teammates Elgin Baylor and Jerry West, 50 points; 1965-Cincinnati teammates Oscar Robertson and Jerry Lucas, 53 points; 1967-Warriors teammates Rick Barry and Nate Thurmond, 54 points.